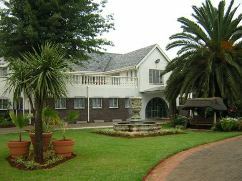 known La Campana Mediterranean Restaurant in Boksburg.Set in tranquil gardens it boasts a variety of facilities to accommodate all conferences and functions from 6 delegates to 130. Situated on the East Rand, 8km from Johannesburg International Airport. 2km from the National Highway between Johannesburg, Kempton Park and Pretoria - a convenient location - in a peaceful country atmosphere. La Campana's Toscana Lapa which comfortably seats up to 130 guests, is ideal for product launches, conferences, year-end corporate functions, birthdays and weddings. Expert care is taken with the theme decor for these special events. Our 3 Star accommodation options includes, executive luxury suites,executive double rooms,standard twin hotel rooms, all rooms are en-suite, very comfortable and are fully serviced.